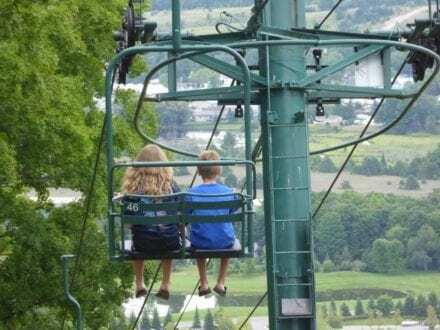 Photo by Jamie Bartosch/Suburban TravelingMom During the off-season at Boyne Mountain Resort in northwest Michigan, the chair lifts take you to other activities like ziplining and bike trails. Even if there’s no snow on the ground, ski resorts are really fun places for family vacations. One ski resort where you will definitely get some quality family time together is Boyne Mountain Resort, in northwest Michigan, near the town of Petoskey. It may be a ski resort, but it offers year-round activities that are perfect for families. 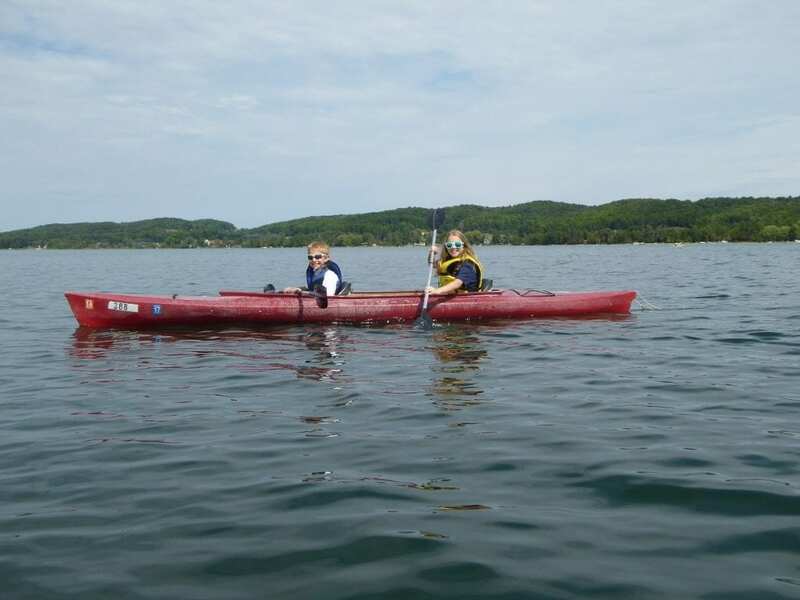 Free kayaks are provided to guests at Boyne Mountain Resort in northwest Michigan. If your family hasn’t stayed in a ski resort in the off-season, then you need to add that to your to-do list. Case in point: Boyne Mountain Resort, just outside Petoskey, Michigan (on the state’s northwest corner, along Lake Michigan and near a number of finger lakes).The resort is absolutely gorgeous in the summer and fall, and there is a ton of stuff for families to do. The ski lifts are used to take you and the kids up to biking trails, ziplining, or a disc golf course. (At Crystal Mountain Resort, in Thomasville, Michigan, they have an alpine slide. Read my review of that here). I visited Boyne in August with my family, which includes a 10 and 12 year old, and found everything we like to do within the confines of the resort. We played in the lake and kayaked on their private beach; whizzed down ziplines (the awesome guides taught us how to go upside-down and hands free); chilled in our spacious and comfortable two-level room (with a full kitchen); and on a rainy day, rode slides in their large new, indoor water park. We also played lawn games and watched an outdoor magic show, next to a bonfire with free s’mores. Everything! It’s a comfortable, homey resort, and there is so much to do. We spent five days here and didn’t have time to do everything. Best of all, almost all of the activities are stuff families can do together, like ziplining, bike riding and horseback riding. There are free chair lift rides, free kayak rentals and disc golf, a free putting green and shuffleboard along the lake, lawn games, and discounted indoor water park passes, Perhaps best of all, there’s just a nice friendly, laid-back vibe among guests and employees, which makes you feel comfortable. 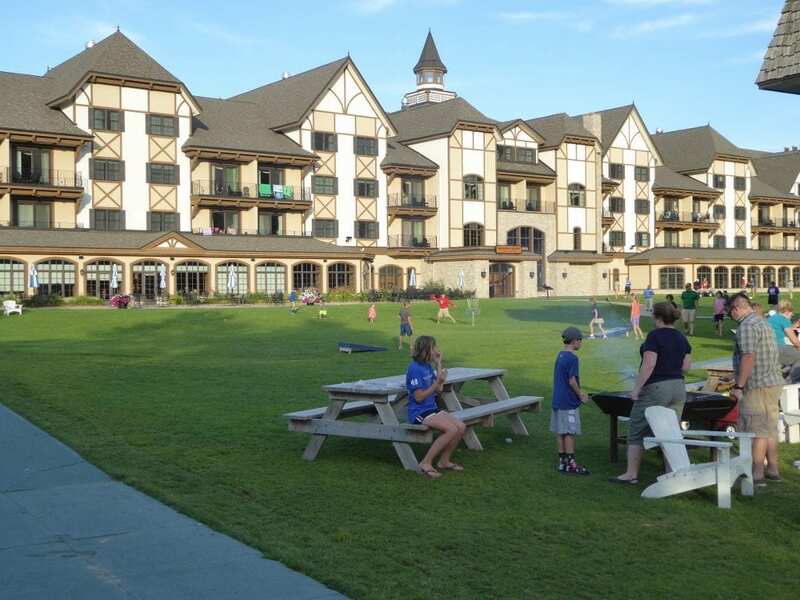 The lawn area of Boyne Mountain Resort has games, smores, and space for kids to just run around. The WiFi is free, which is awesome, but the signal is poor. Maybe it’s because our room was at the far end of the resort, but the WiFi rarely worked. I know, first world problems, right? Also, this isn’t a “doesn’t work” critique, but just a heads-up: while you can buy packages that include certain activities, a lot of stuff is a la carte. Ziplining the whole course is $64 per person, water park admission (even at the guest rate) was at least $25 per person (prices varied depending on age and times), bike rentals were $20 per person for three hours, and horseback riding is $49 per person (for a 1-hour trail ride). All of these activities are TOTALLY worth the money, but make sure to figure those costs into your vacation budget. Prices start at $84 per night. Guests can also upgrade their lodging to one of many condo and cabin options available. The family-friendly Salzburg Suite in Boyne Mountain resort contains a room with four bunk beds and a TV. Our two-level Salzburg Suite was large, updated and clean. It had two full bathrooms, three bedrooms, a gas fireplace, an outdoor patio, and a well-equipped kitchen with a dishwasher. It was actually a little too big for our family of four – but space helps everyone get along, doesn’t it? The mattresses were good quality, to the point where everyone in our family was commenting on how well we all slept. 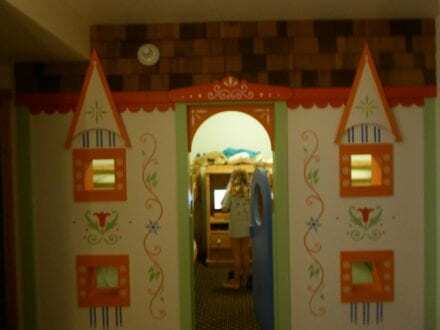 One of the bedrooms was cutely decorated like a castle with four bunk beds and a TV inside. At least once a day, we used the full kitchen to cook meals (something we do to save money). The housekeeping staff even did our dishes – something I tip extra for, because I so appreciate not having to do it myself. Everything here, from the indoor/outdoor pool to the beach to the chairlift, is nice, well-maintained and operated by a friendly and well-trained staff. If you ask my kids what was their favorite part of Boyne Mountain Resort, they’ll say the ziplining. After riding a chairlift to the top of the 10-line course, the fun guides taught us how to flip upside-down and go hands free. We even played a game on one of the lines (drop a beanbag into a garbage can as flew past). So fun! The resort’s beach is outstanding. While only an option in summertime, the water is shallow and clean, and you could walk out really far into the lake and still only be waist deep. Perfect for an in-water family game of catch or frisbee. At the beach, we also played shuffleboard, mini golf, tried paddleboarding for the first time, and raced each other in kayaks. A perfect family day. The indoor water park was also a standout. Not too crowded, well monitored by lifeguards, fun slides, and a surf simulator made this a great nighttime or bad weather activity. Plus, when I didn’t feel like going in, I could hang out on the water park’s second floor overlook, have a beer, and wave to the kids. The resort also has a little shopping and dining area that includes a great toy store with unique toys and candies. 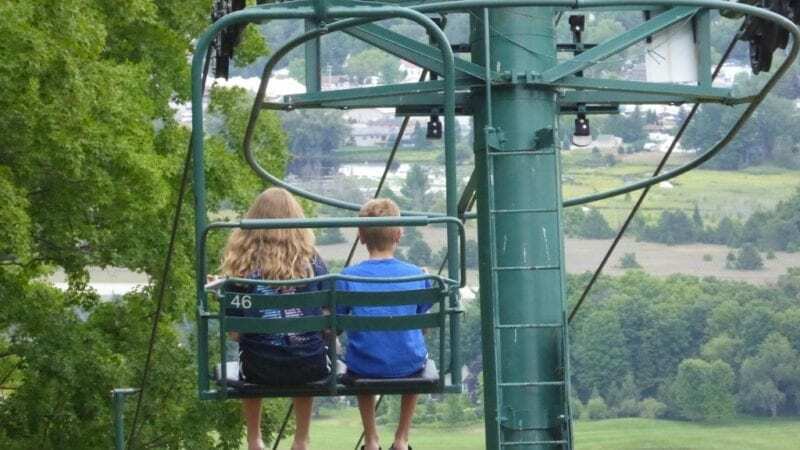 During the off-season at Boyne Mountain Resort in northwest Michigan, the chair lifts take you to other activities like ziplining and bike trails. All of the resort’s dining options were solid and family-friendly. But we usually went out to eat in Petoskey or Charlevoix, the two big towns that are a 20-minute drive from Boyne. EAT THE CHERRY CRUMBLE PIE AT GRAND TRAVERSE PIE COMPANY IN DOWNTOWN PETOSKEY. I’m writing that in all caps on purpose, because this was, flat out, the best pie I’ve ever had. Fresh cherries, a buttery, flaky crust, brown sugar crumbles on top, served with a scoop of vanilla ice cream … I’m drooling just thinking about it (We bought $50 worth of pies to bring home as gifts). It’s a Panera-styled restaurant that looks like nothing special, but it is. Assuming you don’t want to eat pie all day (or do you?) there are a few spots worth mentioning near Boyne Mountain Resort. Jesperson’s in downtown Petoskey had delicious fresh homemade pies, And go to the enormous Kilwin’s store in downtown Petoskey for moan-inducing fudge, saltwater taffy, chocolate creations, ice cream and kitchen tours (there’s also a mini-store in Boyne Mountain Resort). We also really liked the historic Hemingway hangout, City Park Grill, which served above-average sandwiches and salads. Try their free, fresh-from-the-oven biscuits, which they’ll walk around and serve right off the baking tray. Tip #1: While there’s a grocery store in Boyne City, which is closer to the resort, it’s very expensive there. You’re better off going into the Meijer or Wal-Mart in Petoskey, which are enormous new grocery stores with low prices and huge selections. Tip #2: Consider visiting Boyne Mountain Resort’s indoor water park at night, when the prices are discounted. Tip #3 Watch the sunset from any waterfront. It’s a popular (and free!) thing to do, the orange and pink colors of the sky and clouds are spectacular. The closest place to Boyne Mountain Resort is Boyne City’s waterfront. Tip #4: Pod Hill Farm is a short drive from Boyne, and they have a great restaurant, petting zoo, farm and store. Collect the famous smooth Petoskey stones on the Lake Michigan beaches near Boyne Mountain Resort. 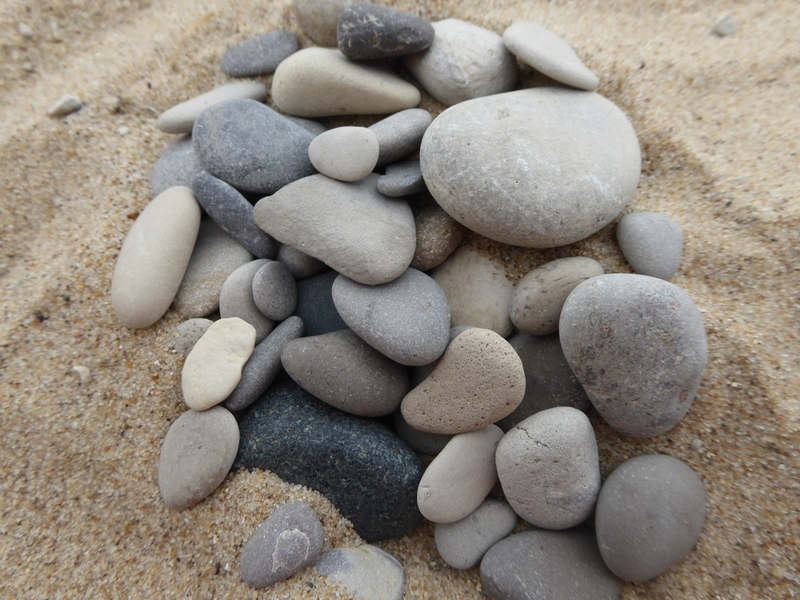 Tip #5: Collect the famous Petsokey stones on the beaches of Lake Michigan. Our family’s favorite beach was the public beach in Charlevoix, which was loaded with colorful stones and had a lighthouse you could walk out to. Tip #6: Come back in the winter and ski!